Palestinians fired a barrage of home-made rockets at the Israeli border town of Sderot Monday, killing an Israeli man and a 3-year-old boy near a nursery as youngsters were arriving at school. It marked the first time in nearly four years of fighting that Israelis were killed by rockets from Gaza, and harsh Israeli retaliation was expected. Prime Minister Ariel Sharon called an emergency security Cabinet meeting for Monday — an indication that he would seek special approval for military action. However, Sharon also told a closed-door meeting of legislators Monday that he is determined to go ahead with a planned withdrawal from the Gaza Strip, and that he would speed up the voluntary evacuation of settlers by making first compensation available immediately, instead of only in August. Sharon's hawkish opponents, including unhappy members of his own coalition, say the offer amounts to bribery, reports CBS News Correspondent Robert Berger. The Islamic militant group Hamas claimed responsibility for Monday's rocket attack, which wounded seven people, including the toddler's mother, who was in critical condition. "Who is watching out for us? No one. That's my message to the prime minister," said Yitzhak Ohayon, the father of the slain child, Afik. The rockets fell just hours after Hamas and the Al Aqsa Martyrs' Brigades blew up an Israeli army outpost in the heart of Gaza with hundreds of pounds of explosives, killing an Israeli soldier and wounding five. In Gaza, four Palestinians were shot dead by Israeli troops overnight. Israeli troops destroyed 10 Palestinian homes near the outposts, and divided Gaza into three parts, preventing most travel on the main north-south road. In Monday's attack, one rocket hit around 8 a.m. local time, on a street between the Lilach and Yasmin nursery schools as children were being dropped off. "I got to the office and I heard the booms, and I rushed back to the nursery," said Ricky Dahan, who had just dropped off her 4-year-old daughter, who was not injured. "There was a huge boom. I was very frightened and ran away," said 18-year-old Chen Smadja, who was on her way to a nearby high school. 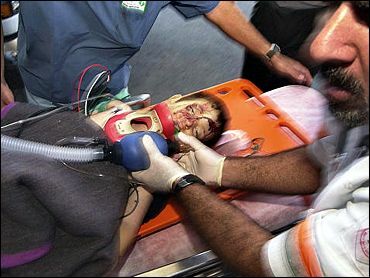 A 50-year-old Israeli man and 3-year-old Afik Ohayon were killed. The child was just a yard from the site of impact, witnesses said. The blast blew out the windows in the nursery schools, which had flowers painted on the outside walls. The sidewalk outside the nurseries was stained with blood. Rescue workers wearing white vests and gloves searched the scene for body parts, to ensure complete burial, in line with Jewish tradition. A man's sandal lay on the ground, in a pool of blood, near a hat that had a balloon attached to it. Dahan said the children were to have their end-of-school party Tuesday. Hospital officials said seven people were wounded, including the toddler's mother who was in serious condition. Another missile hit near a small shopping area, blowing out car windows, but causing no injuries. Two more rockets fell on the outskirts of town. Hamas has fired dozens of rockets in recent years, frequently targeting Sderot, a working class town close to Gaza, and just a mile from Sharon's desert ranch. Late Sunday, militants blew up an Israeli army outpost in the heart of Gaza. The attackers had dug a 1,000-feet long tunnel to the outpost, and stuffed it with hundreds of pounds of explosives. The blast collapsed a building, killing one soldier and wounding five. "The Palestinians, although their means are sometimes rather primitive, are also rather successful," an Israeli army commander in Gaza, Brig. Gen. Shmuel Zakai, told Israel Radio. At the targeted outpost, Israeli troops had dug tunnels themselves to thwart a Palestinian attack from below. Zakai said the Palestinian attackers had simply dug deeper, "and that is how they got under the outpost." Hamas and Al Aqsa claimed joint responsibility, saying they were avenging leaders and key activists killed by Israel in recent months. In the immediate aftermath of the blast, a Palestinian police officer and a 15-year-old boy were killed by Israeli fire from tanks and machine guns. Troops were responding to Palestinian fire at the scene of the explosion. Two more Palestinians were killed by troops early Monday — a truck driver who drove on the north-south road after soldiers closed it to traffic, and an armed man the army said was approaching a military outpost. Early Monday, Israeli helicopters also fired missiles at two suspected weapons workshops in Gaza City, causing some damage, but no serious injury. The burst of violence came as Egypt was trying to broker a cease-fire between Israel and the militants ahead of a Gaza pullback. However, more violence is expected in the time leading up to the pullout, to be completed by the end of 2005. The militants want to step up attacks so they can portray the withdrawal as a hasty retreat by Israel. The military, in turn, hopes to strike hard at the armed groups to prevent any gloating and weaken their ability to attack Israel after a pullback. An Al Aqsa spokesman said the outpost attack is "a message to Sharon that ... our fighters will continue the holy struggle until we uproot them (Israelis) from our land." Also Monday, Sharon told a parliamentary committee that settlers who would resist the upcoming evacuation of the Gaza Strip and northern West Bank in undemocratic means would receive less compensation than those who cooperate. "It is inconceivable that settlers who resort to violence and hurt … troops or policemen or harm property will receive the same amount of compensation as those who [do not]," legislator Ran Cohen told Israel Radio.